Pictured is the front of the building at 18 E. William St. in Delaware. The previous home of The Delaware Gazette, the city-owned structure recently underwent renovations. It will reopen soon as the home of COhatch. An inside look at the first floor of the former Delaware Gazette building at 18 E. William St. COhatch is leasing all but the second floor of the building from the City of Delaware. Everything COhatch represents is centered around community. 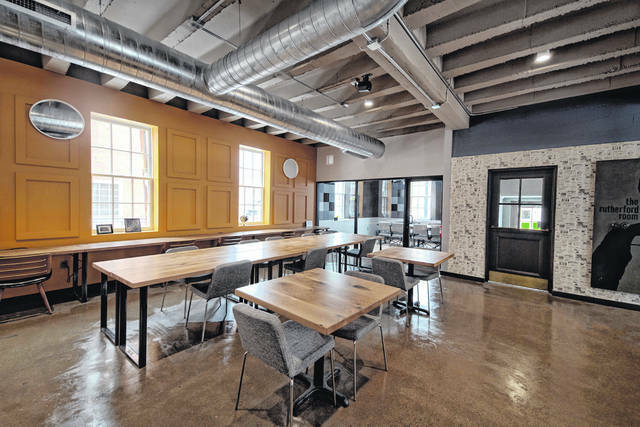 Now, nearly a year after announcing Delaware as its newest location, the Worthington-based company is set to showcase that approach at the newly renovated Gazette building, located at 18 E. William St. in downtown Delaware. Appropriately named, “The Newsstand” opened its doors on Friday, joining “The Library” and “The Hardware Store” in Worthington as COhatch’s third location. 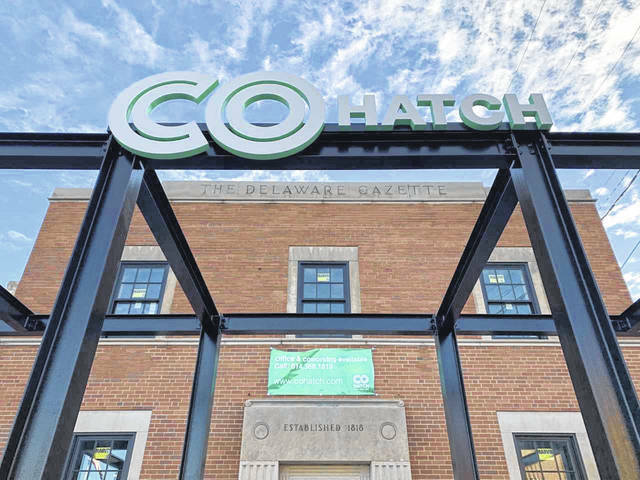 COhatch buildings are meant to cater to small businesses, startups, and entrepreneurs looking for dedicated working space. The shared working space facility will feature more than 20 private offices, a dozen dedicated desks, seven meeting rooms, and more than 50 spaces to co-work. With just a few clicks on the company’s app, members can see conference room usage and book the space in accordance with their schedules. Various types of memberships are offered, whether a long-term, private office is needed, or simply a few hours a month. Fees could be as low as $59 per month for those only needing space for a few hours a week, or more for extended use. Matt Davis, the majority owner, said one of the things he heard most often from members during the first months after the Worthington location opened was the instant credibility working out of the COhatch building brought to their business. Meeting with clients or potential buyers in a work establishment, rather than a house or local coffee joint, adds a level of legitimacy to any business, Davis said. He added there is credibility in the COhatch name. After all, it began in the same fashion as many of the buildings’ tenants. Before founding COhatch, Davis said he worked as an executive in the corporate world, but he grew tired of working to make someone else money. The name, he said, was a product of his team’s brainstorming sessions. It combines the elements of community and company together with being a business incubator. “Together, we’re going to hatch this community center out and grow things out of it,” Davis said of the name selection. But the social enterprise, founded in 2016, is more than simply a shared working space. The Delaware location features a kitchen, a full-fledged theatre room, which includes a 130-inch 4K screen, as well as a game room that features a variety of games such as a pinball machine, Pac Man, and more. Operating under the motto of “strengthening communities and improving lives,” the building is purposed for members to mingle with other inhabitants, and also to provide a family-friendly environment. Members are free to bring their kids to work with them when needed, perhaps when school is canceled, and the amenities of the building make it convenient for parents to do so. Members can also use the building for events such as birthday or anniversary parties. “Life happens, and you can do it here,” Davis said of the all-welcoming feel of COhatch buildings. Three other buildings — Upper Arlington, Polaris, and Springfield — are currently being developed. The plan, Davis said, is to have at least 12 locations in central Ohio, as well as 20 units in the Midwest within the next five years. Members of one building have access to all COhatch locations. Anyone interested in renting space or simply learning more about COhatch can visit the company’s website at www.cohatch.com.